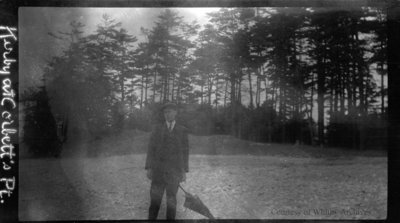 A black and white medium format negative of Kirby at Corbett's Point. This negative has started to degrade. Corbett's Point is located on the shore of Lake Ontario, east of Thickson Road. It was later renamed Thickson Point. Kirby at Corbett's Point, c.1915, Photographer Unknown. Whitby Archives A2014_001_006.